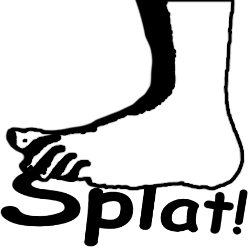 Splat is a programme to generate and manipulate audio data. It's rather a programming component which can be used within a programme, so it can be used in an infinite number of ways. It is written in Python (with some bits in C under the hood for speed) to create about any sound you can think of and describe in software. Each piece is typically a Python script (a plain text file). You can combine it with all the amazing tools that come with the language to then directly generate your piece. It can be mixed with other Python modules to manipulate images with sound, or generate sound from images, or use mathematics to calculate sounds, or random functions to create music that changes endlessly. It has functions to edit existing audio data and mix sound fragments together. It can also generate continuous curves to generate frequency or envelopes, or anything you can think of. Splat also knows about notes, or rather scales, although there is no interface that looks like a music score. However you can create your own scale, or easily generate the same piece, for example with equal-tempered (a.k.a. logarithmic) or diatonic scales. It's a work in progress growing continuously, many more things can be added to it. Dew Drop is a very short piece that comes with it and which you can listen to on this page. The characteristic thing about it is that the duration of each note is based on the so-called "golden ratio". They were calculated by dividing the total length of the piece many times. The notes form a simple harmony with 3 voices, but the rhythm is irrational so there's no regular tempo. You can get the code and more on GitHub, download the latest PDF manual and listen to some splats on SoundCloud.